If there is any fruit season that absolutely must not be missed, it’s stone fruit season, specifically peach season. From July to August, peaches are in an utterly perfect state of juicy ripeness and are chock full of flavorful juices. These late summer gems lend themselves to a variety of uses, my favorite of which include galettes, ice creams (like this one), and even salads with burrata and balsamic. This ice cream, specifically, uses all grass-fed dairy to achieve an earthy and organic taste that compliments the fruit effortlessly. Large amount of vanilla are avoided, in order to really emphasize the peach and ricotta flavors. 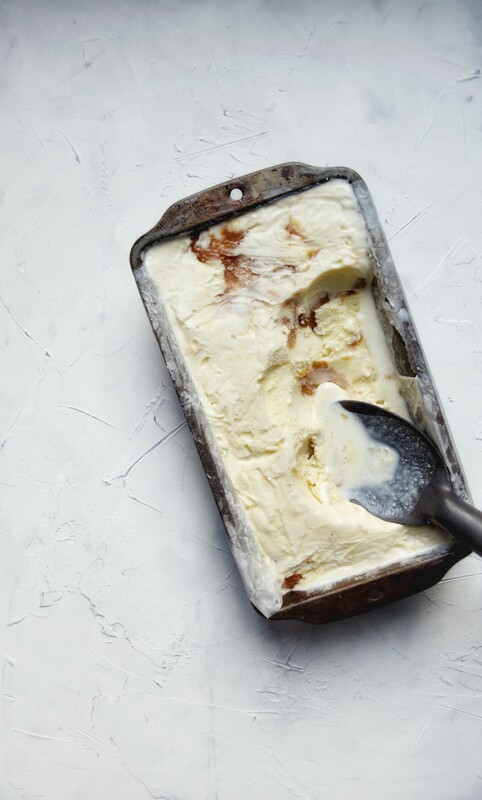 The ricotta cheese, not exactly a traditional ice cream ingredient, creates a uniquely creamy mouth feel, adding a slight level of freshness that prevents the ice cream from seeming overly rich. 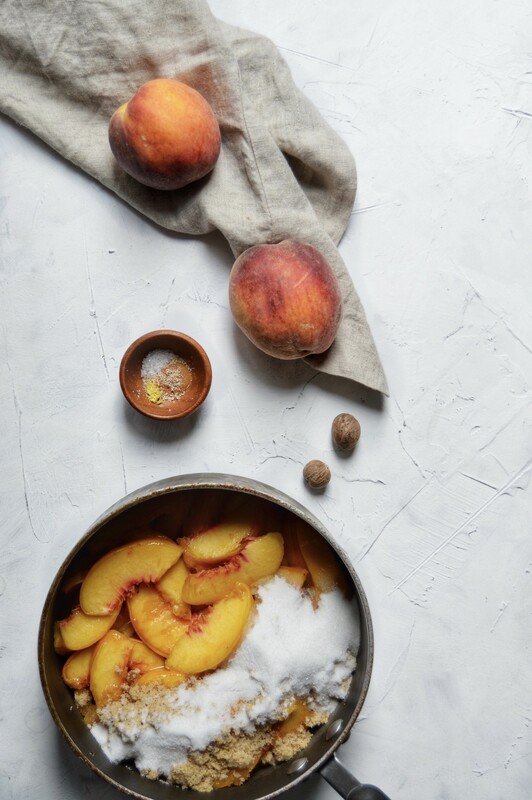 The peaches are cooked with sugar and fall spices, giving them a familiar, cobbler-like taste that melds incredibly well with the simple custard. Either of the components in this recipe could be served à la carte; that is, serving the caramelized peaches atop crispy waffles instead, or just making the ricotta ice cream by itself. Use this to your advantage, I don’t think anyone would be opposed to omitting the peaches and subbing in a swirl of caramel, or espresso-infused ganache. In order to succeed on the ice cream excursion that awaits you, there are really only two things you need to do. Don’t scramble the eggs — When whisking the the eggs into the warm milk mixture, remember to whisk constantly and quickly. Nobody wants omelette ice cream. Strain the custard — After everything is mixed, you’ll want to run the custard through a fine mesh strainer. This will rid it of any leftover ricotta crumbles or errant eggy bits. What’s the best way to peel peaches? — Blanch, blanch, blanch. Bring a medium pot of water to a rolling boil. Working no more than two at a time, submerge the peaches in the boiling water for about a minute. Immediately transfer them to a bowl of ice water and then peel the skins off with your fingers (they’ll slip off easily). What if I don’t have an ice cream machine? — Unfortunately, the whole milk content of this recipe means that it will develop an excess of ice crystals if not churned in an ice cream maker. If you want to make a no churn version, simply replace the whole milk with an 8oz can of sweetened condensed milk and only use 1 tablespoon of the granulated sugar. Freeze for 4 to 8 hours. If you are looking to purchase an ice cream machine, I recommend this one, available on Amazon. What can I substitute for the ricotta? — If you don’t like ricotta or simply don’t have any, you can substitute seamlessly with mascarpone, or even cream cheese. Use grass fed dairy, organic peaches and high quality spices — There are some recipes where using non grass fed dairy won’t make a noticeable difference — ice cream is not one of these. If you want to maximize the flavor of the custard, try to use grass fed, preferably local dairy, organic, in season peaches, and the highest quality spices you can find. For spices, I recommend Penzey’s, available here, on Amazon. In a medium, heavy bottomed pot, combine the peaches, sugars, spices, salt and lemon juice, stirring to combine. Cook covered on medium-high heat for 30 minutes, stirring occasionally. Set aside to chill to room temperature and then place in the refrigerator. In a small bowl, thoroughly combine the ricotta, vanilla extract and lemon zest. Set aside. In a medium sized saucepot, combine the cream, whole milk, granulated sugar and salt. Heat on medium heat until the mixture is bubbling at the surface and the sugar has dissolved. Remove from the heat. Whisking constantly, add the egg yolks to the cream and sugar mixture, working quickly so that the eggs to not scramble. Return the mixture to the stove and cook on medium low heat for 5 minutes, or until the mixture is thick enough to coat the back of a wooden spoon. Remove from the heat. Whisk the ricotta mixture into the custard until no lumps remain. Strain through a fine mesh strainer and chill in the refrigerator for 2 hours. Disclosure: Some of the links above may be affiliate links. These are links directly to products I love and use on a daily basis. Affiliate links help to support Thyme for Breakfast with a small monetary commission, without any added cost on your end. Please email scott@thymeforbreakfast.com if you have any questions.